Motrin Liquid Gels Super Strength help to relieve your everyday aches and pains so quickly, you’ll be back to doing the things you love before you know it. Also delivers fast relief from fevers and other pains. Directions: Adults and children over 12: For migraine headaches, take 1 capsule at the first sign of symptoms, and every 4 hours as needed. For all other uses, take 1 capsule every 4 hours as needed. Do not exceed 3 capsules in 24 hours, unless directed by a physician. Medicinal Ingredients: Ibuprofen, 400 mg.
Non-Medicinal Ingredients (alphabetical): Gelatin, pharmaceutical ink, polyethylene glycol, potassium hydroxide, propylene glycol, purified water, and sorbitol. There's no pain like a jaw, teeth, and ear ache combination. 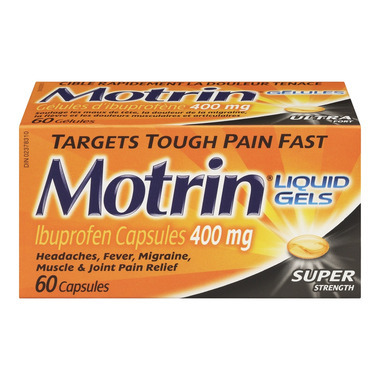 I used Motrin Super Liquid Gel Ibuprofen capsules of 400 mg to relieve the pain. I find it easier to swallow the gel capsules and I don't have the tightness in the chest of them going down as I usually get with other non-gel pain relievers. Even though I had multiple areas of pain, with Motrin Super I was finally able to carry out my everyday activities, such as driving the kids to school and standing in line at the grocery store. I enjoyed the fact that I didn't have any side effects, there were plenty in the package (so I didn't have to worry about running out in the middle of the night), and they were safe enough for my oldest child. Now that I've tried the Motrin Super Gels and had such great success I will definitely be ordering them again.